Grace O Malley – The Pirate Queen: This castle is a fine example of a Tower House, built by the O’Malley's in the sixteenth century. Grace O’Malley or Gráinne Uaile who headed the fleet of pirates who reigned supreme in the Clew Bay area at that time. The tower house is located on the left of the pier as you disembark from the ferry. Cistercian Abbey: It's about a 15-minute walk from the pier – keeping left of the pier and walking towards O'Malley's food store. The Abbey is said to date from the 12th Century, though it was rebuilt around 1460 and is widely known for its elaborately detailed with carved figureheads. Additionally, it houses an O’Malley crest and is rumoured to be the burial site of Grace O’ Malley(Granuaile). It also contains a remarkable series of medieval wall and ceiling paintings. (Please note here is a small sign asking for “No Flash Photography”.) The paintings which once covered the entire ceiling in a kaleidoscope of colour, depict mythical, human & animal figures including dragons, a cockerel, stags, men on foot and on horseback, a harper, birds & trees. Only four other such paintwork examples still exist in Ireland & Clare Island’s is the most intriguing and maybe the best preserved. Also within the abbey is a fine stone plaque of the O'Malley coat of arms and a canopied tomb reputed to be the resting place of Granuaile O'Malley the famous lady sea pirate. Another of the Napoleonic Towers is located at the western point of Clare Island, at Tuar Mor. Constructed in 1804, as an answer to the impending threat of a Napoleonic invasion during the Napoleonic Wars of 1803 to 1815. The Clare Island tower forms part of a whole network of towers along the coast of Ireland. These towers were central to the early 19th-century communication and alert system. Knockmore Mountain: The mountain is the highest peak on Clare Island. 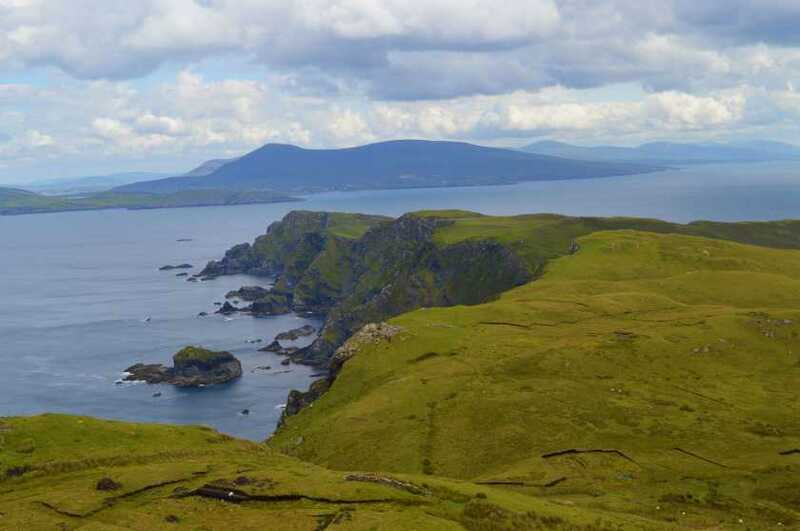 It is a popular walking destination for island residents and tourists and is known for its view of Clew Bay and the west coast mainland as well as a view of the Atlantic Ocean. It's an easier climb approaching from either side but does get very windy at the summit even on the finest of days.